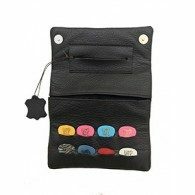 Tobacco pouch made of Suede Leather, handmade and handstiched with two magent closure system. You place the original tobacco plastic bag to preserve the tobacco moisture and so it stays always clean. The inside is velvet linnining for extra softness and fits all brands including the 50gram packs. It has an extra pocket with zipper for filters or a credit card or some small cash and a case for the papers.